That’s literally the comparison they just made. The video ends with the dropping of a bomb, and a large explosion. It’s unclear if the bomb was a nuclear device. 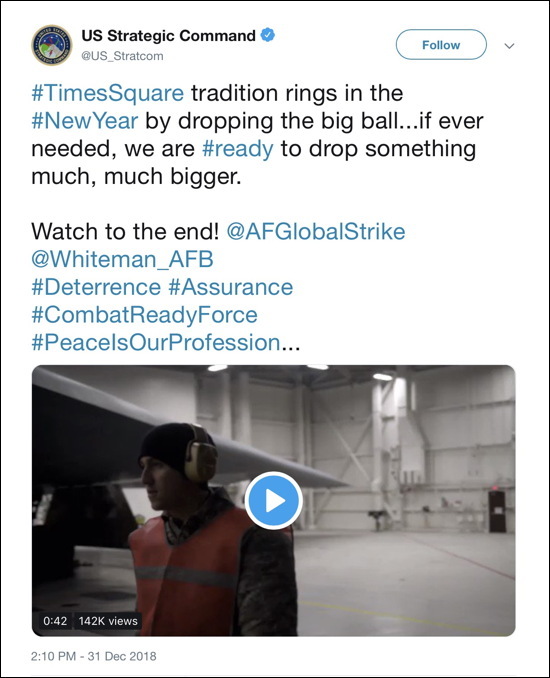 #TIMESSQUARE TRADITION RINGS IN THE #NEWYEAR BY DROPPING THE BIG BALL…IF EVER NEEDED, WE ARE #READY TO DROP SOMETHING MUCH, MUCH BIGGER. The @US_Stratcom perverts’ boss was not delighted by their tweet. They deleted it.